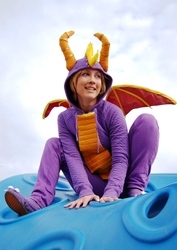 Kudrel is a Master level cosplayer and costume accessory designer from Ottawa, Ontario. She got into cosplaying back in 2004; attending the first AC-Cubed, and has been addicted ever since. She's won over 10 awards for her costumes including Best in Class in several divisions and Best in Show. She has also had the pleasure of becoming Co-Founder of a line of costume accessories called Steampixie. Why can't she stop? She thrives off the creative challenges of bringing the most otherworldly fictional characters to life and tackling some new skill or technique with every new project. She believes that a cosplayer's work is never done because the possibilities are endless! Her personal goals are to stand out and take on cosplays no one else dares, to add substance where others see only a beauty contest, and to bewilder others and make them go "Wow! You don't see that enough!" She strongly wants to inspire other cosplayers to push their limits and not be afraid of being different. Cosplay isn't about being the hottest or prettiest version of **insert overly done popular character name here**! It is about having fun and empowering yourself. It's about being an artist and being free to accomplish anything and everything.